The audio on demand industry is booming, and has been forecast to keep growing exponentially from year to year. This is why the time of the podcast is now, and why understanding and determining your purpose is so important if this is an avenue you want to explore. 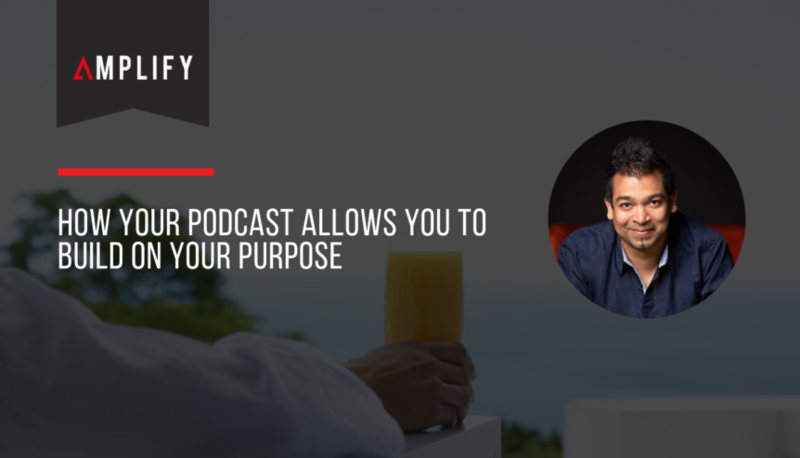 On a recent episode of Should I Start a Podcast, we have the keynote speech from Ronsley Vaz, who gave us insight into building upon your purpose as a podcaster, and how to set yourself up to win every day. Unbeknownst to some, having a solid morning routine is actually hugely beneficial to determining the outcome of your day. How do you start your day, do you just get up and go, or do you get into the swing of the day with a vigorous workout? Ronsley suggests using the Hal Elrod, Miracle (6 minute) Morning method, which breaks down six, minute long tasks, ranging from one minute of silence to one minute of exercise to set you up for the day. Alternatively, finding a single act such as making your bed can just as valuable. By researching different types of morning routines, and aligning yourself with one that might benefit you, you could see more wins throughout your day. There are huge advantages to building a podcast, particularly on a personal level. Creating a podcast, no matter what format you choose, gives you the opportunity to generate a space that is completely your own. Whether your podcast is for personal or business endeavours, you can be yourself – something that audiences appreciate – as well as getting the chance to voice opinions that can resonate globally. As natural progression occurs, you will see that you get to meet amazing people, build a community and gain recognition. Today, people seem to be busier and have less time to just sit and absorb, this is why the podcast has risen in popularity. The main reason behind this growth lies in Podcasts being a mode of instantly accessible entertainment, engagement and communication for both consumers and businesses. Ronsley says, “It’s something that you don’t have to stop to consume,” and he’s right. Podcasts are set to increase into the realm of billions of downloaded hours per year, and with over half of US households tuning into a podcast at least once a week, this means there’s a huge place in the market for storytelling. Working within the podcast format means that you can establish a connection with someone for much longer than say with a Facebook ad, or Instagram post. Now is the time to put aside any fears and create a podcast based on your passions. Tell your story, whatever it is, and someone casually doing the washing up halfway around the world may just prick up their ears and tune in. By understanding where your passions lie, creating a podcast can help develop upon the things that matter to you most. Not only do you have the capability to voice your opinions, but you also have the means to extend your reach and connect with people globally.